“Macavity: The Mystery Cat” by T.S. Eliot and illustrated by Arthur Robins, is a picture book purr-fect for a read-aloud. 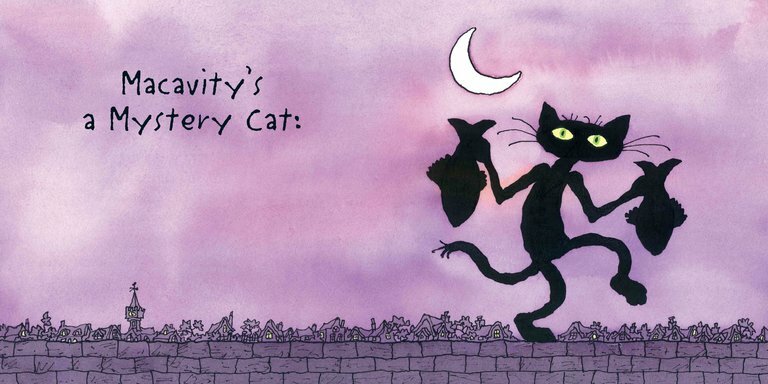 The “Cats” revival on Broadway coincides with the release of the Eliot poem about Macavity cat.A series of Eliot books based on his Cat poems will be released and “Macavity” received a good review in the NY Times as a poem that has translated well to the 32-page picture book vehicle. Playful with rhyme and language, “Macavity” repeats the phrase, ‘Macavity’s not there!” as a catchy line for youngsters to hook onto. For cat fans everywhere. This entry was posted on August 4, 2016 at 7:13 pm and is filed under Adult Readers Advisory. You can follow any responses to this entry through the RSS 2.0 feed. You can leave a response, or trackback from your own site.